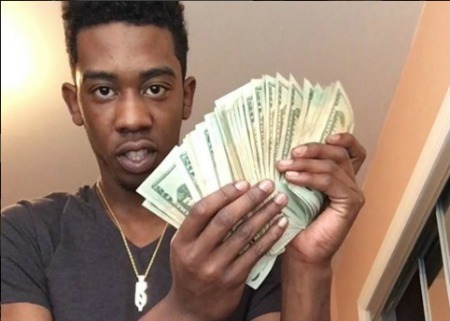 “If Yeezy don’t like ya, I’mma cut ya!,” Brooklyn rapper Desiigner screams while standing on a chair, reciting the opening lines from his new song “Muddy Sierra Mist.” Desiigner has had a meteoric rise in the past month, going from a relative unknown to a breakout star and newest member of G.O.O.D. Music. “I’m just a kid from Brooklyn,” Desiigner says. He notes that his name is derived from his father, who was infamous for selling bootleg clothes on Manhattan, New York’s Canal Street. Before choosing his handle Desiigner says he chose between “Soon,” “Tomorrow,” “Next Day Air” and “Past” as rap names. Desiigner recalls his biggest childhood influences as Sacario, The Realest, Topp Dogg, and Angelous. Many fans and critics are noting Desiigner’s uncanny similarities to Atlanta trap rapper Future. Desiigner welcomes the comparisons. “People say I sound like Future, and I don’t mind it,” he says while fixing his top hat in the mirror. Desiigner notes that he began making music by “rapping over Future songs.” When I asked him if he meant Future beats, he told me that he rapped over full Future songs and released the overdubbed projects. Desiigner says he eventually started making money in his neighborhood by recording his own music and selling it as Future mixtapes. That’s how “Panda” got the ear of Kanye West. West was in a Brooklyn boutique clothing shop when the energetic song came on. The store owner notes that Kanye said “Future never stops,” before being informed that the “Panda” record was Desiigner’s. Desiigner looks forward to reaping the benefits of his similarities to Future, saying he intends to grow his hair into dread locks to further the parallels. “I’mma start performing as him in small cities. In a dark club, they’ll think I’m him,” Desiigner contends.